A shuffleboard is an important purchase. Sizewise, it takes up a lot of room. Timewise, you expect your investment to last forever. Therefore, before making that purchase, learn all you can about shuffleboards. How else will you know what type of shuffleboard is best for you? You’ll need to learn about differences in sizes, woods, and finishes. 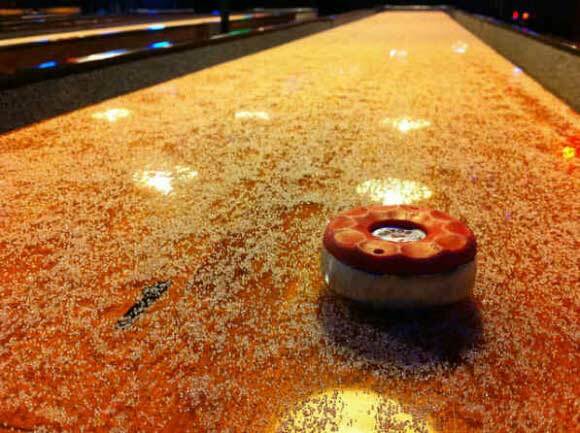 This article focuses on the various types of finishes available for coating shuffleboard tables. Each finish type has unique pros and cons. 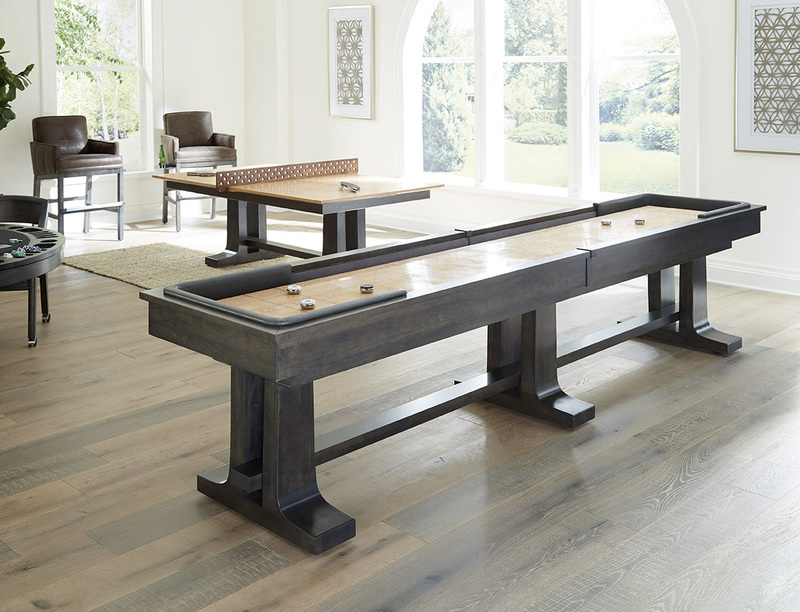 The Loft Table Shuffleboard by California House. Shuffleboard tables made during the early to mid-1900’s were made only from hardwoods, and were typically coated with shellac or lacquer. If you purchased an older table, you may wish to restore it to its original shellac or lacquer finish type. Shellac and lacquer tables can be hand sanded using a fine-grit sandpaper. Sanding strokes should be long and consistent. New shellac can then be applied. Shellac is actually a natural product made from a secretion the female lac bug produces in order to form a cocoon-like tunnel to enable her to traverse tree branches. This resin is scraped from trees, processed into flakes or powder, and combined with an alcohol solvent. One of the most important things a shuffleboard expert should keep an eye out for is the thickness of the playing field. Serious players will begin to notice that even the most reliable boards will get dents and dings after repeated victories. The disks sliding along the sand, the sound of the weights on the glass gives each player that satisfying feeling that can only come from a well-kept playing field. The thickness of a shuffleboard has a major consequence on the upkeep of your field and the enjoyment of your game. 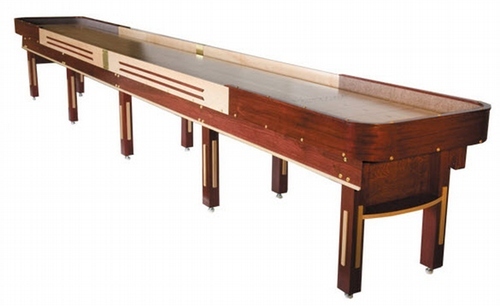 It’s important to understand the labels or descriptions of the shuffleboard tables that you’re buying. There are a few qualities that are almost always present. One aspect that you should really be looking for whenever you’re searching for the perfect model is the thickness of the wooden slabs. HANDY FACT: The most contemporary shuffleboard tables have a thickness of 3”, which is a pretty good number to take as a rule of thumb. Heritage. Legacy. Tradition. 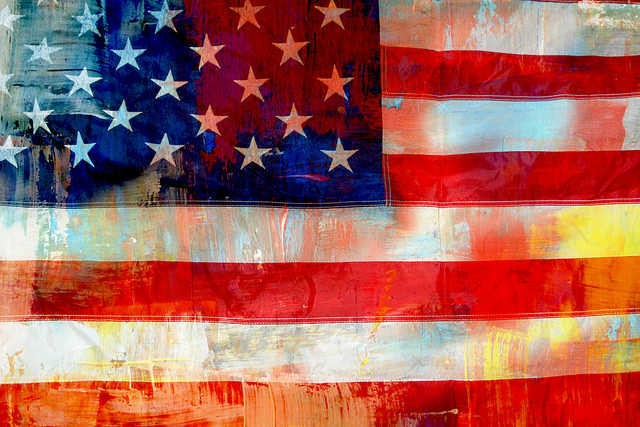 Each of these words represent both the American way and the American small business. Venture Shuffleboard Tables are a prime example of the kind of quality and dedication to craftsmanship that emerge when a company commits itself to honoring American heritage, family legacies, and shuffleboard traditions. First started in 1997, Venture launched with one goal: To create superior American made shuffleboards tables that honor the history of shuffleboard gaming in the US through vintage-inspired designs and unwavering attention to detail. Venture did not only set their sights on the professional shuffleboard world. Their desire to be the best shows through in the amatuer world as well, giving the average player access to unparalleled handmade quality and elegant styling. The Grand Deluxe is just one of many Venture tables. 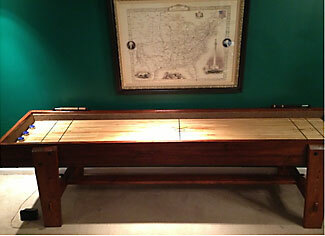 Its design is recognizable to shuffleboard players across the US and has been around since the 1930s. A True Throwback, The Grand Deluxe starts at $5,395. Q: Are Shuffleboard Tables Flat? We get this question from time to time; are shuffleboard tables flat? No, shuffleboard tables are not completely flat. 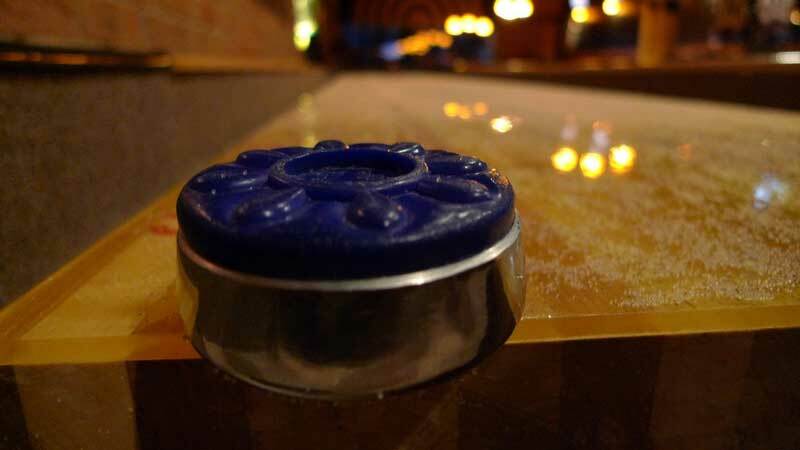 Instead, most shufflepuck players prefer a slightly concaved surface just enough to allow a piece of paper underneath a leveler running across the width of the table. To adjust correctly, the paper should be able to pass through the middle of the table but the edges of the paper should catch. Shot of the Berkley Shuffleboard Playfield. 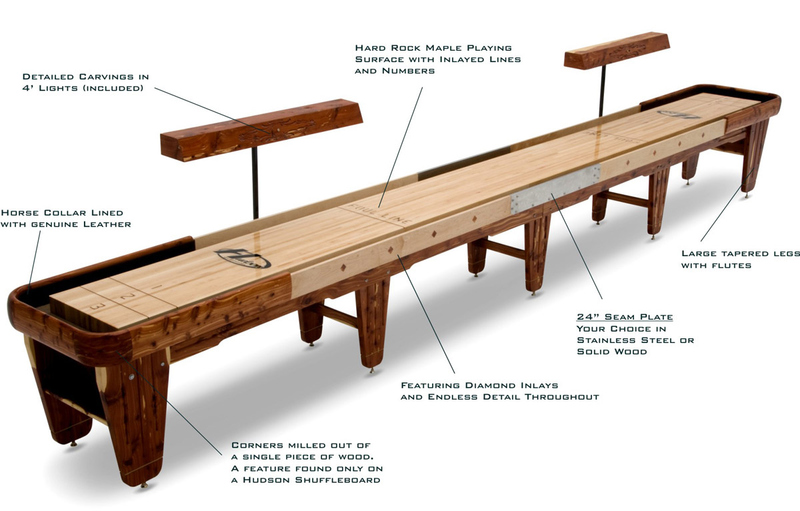 This Shuffleboard Table Buying Guide covers table size, finish options, playfield thickness, scoring systems and much more. Learn everything you need to know before you make your decision. 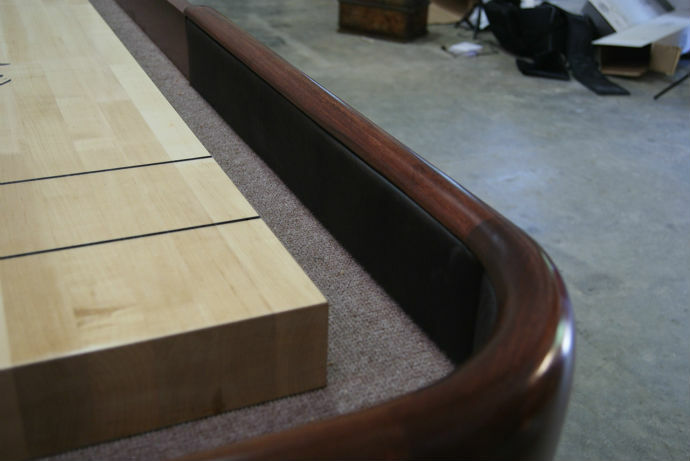 Quality of built materials can effect playing speed, stability, and overall lifespan of your shuffleboard table. *Indoor Shuffleboard tables are made strictly for indoor use. 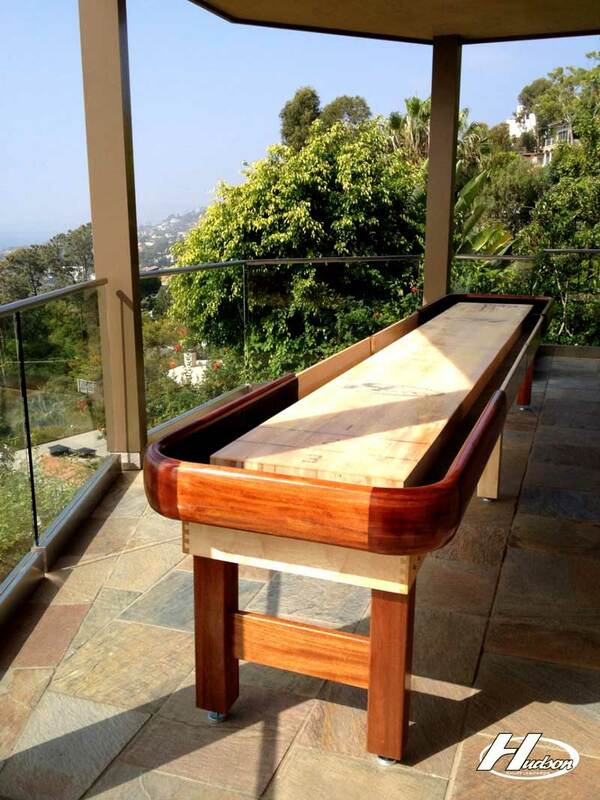 If you are considering purchasing a shuffleboard table for outdoor use, we recommend reading our Outdoor Table Shuffleboard Buying Guide. 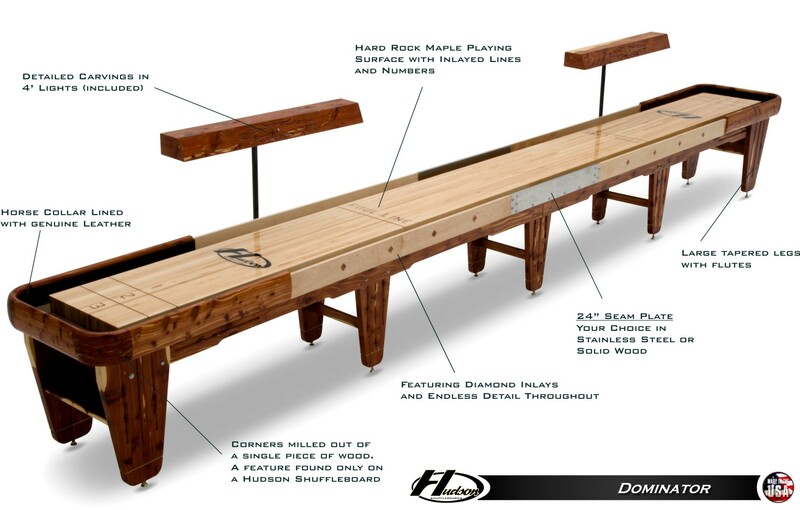 The Dominator Shuffleboard Table features a hard rock maple playing surface with inlayed lines and numbers for the ultimate playing experience. 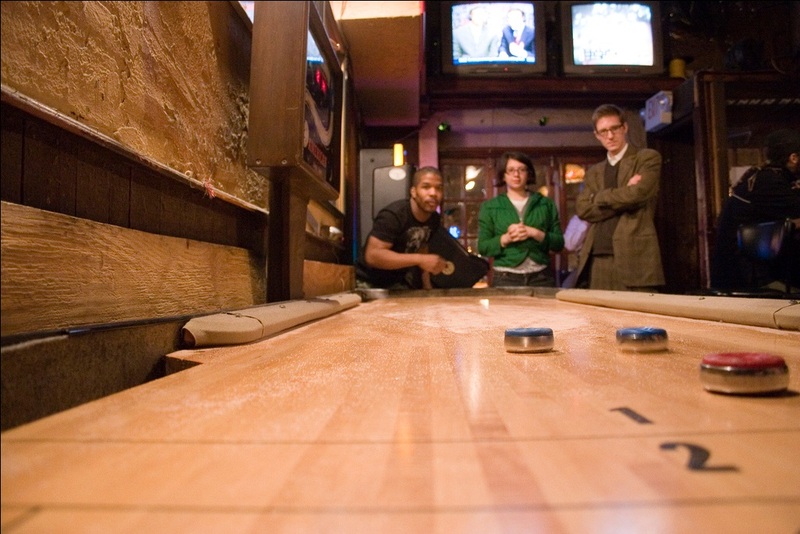 Although primarily played indoors inside of bars and home game rooms, table shuffleboard can also be played outdoors. Of course, it will need to be made of quality materials to endure the unrelenting effect of nature’s elements. This Outdoor Shuffleboard Buying Guide will tell you what to you need to look for. Can I Use an Indoor Shuffleboard Table Outside? 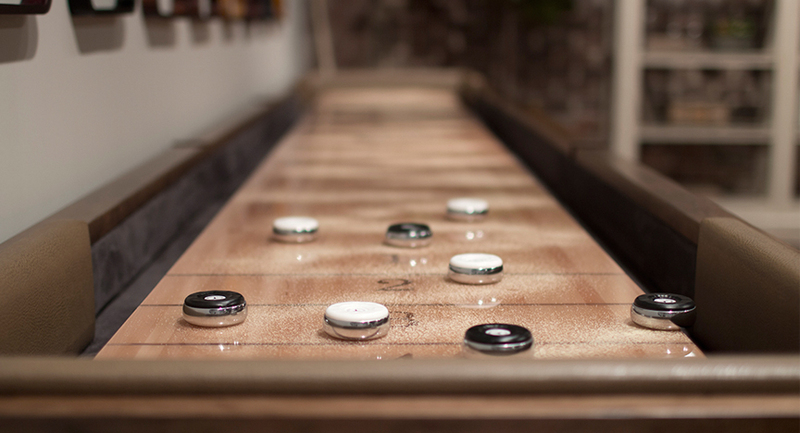 First before we get started, we know what you’re wondering; can I use my indoor shuffleboard table outdoors? Sorry guys and gals, that’s a no-no. It’s like bringing any other piece of home furnishing outside. It’s just not designed to withstand fluctuations in temperature, UV rays from the sun, and water from the rain. Okay, so you’ve decided that you’re going to get a shuffleboard table. Now you’re wondering, What size shuffleboard table should I get ? It’s the next step to making your dream complete. Read this entire guide, yes the ENTIRE guide CAREFULLY. 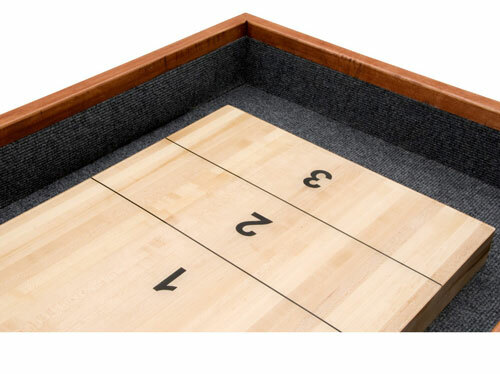 You have to think about how much clearance you need in the location you plan to place your shuffleboard table and more importantly, how you are going to get it into your house. Shopping for a shuffleboard table can be a bit overwhelming. After all, you have to make the right decision. No pressure, right? People always ask, “How much room does a shuffleboard table require.” That’s a bit ambiguous because that really depends on how much room you have.